He married Mary GAMBLE in Mooresville, Limestone County, AL, February 13, 1896. She was born at "Oak Mount," the family farm, December 30, 1866. (Oak Mount was just west of Belle Mina and north of Mooresville.). Mary(34) was the daughter of Ruffin Coleman GAMBLE and Helen Perina GIRAULT. She died June 7, 1953 in Jonesboro, Craighead Co., AR, at 86 years of age. She was buried in Oak Lawn Cemetery in Jonesboro, Craighead Co., AR. Mary's occupation: Teacher, then Dietitian at Chicora College in Columbia, Richland County, SC. William's occupation: Railroad General Agent in Belle Mina, Limestone County, AL. For more complete information on William's life, please see this brief informal biography. 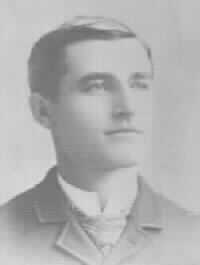 21 i. William Gamble3 NETHERY(35) was born in Belle Mina, Limestone County, AL, August 13, 1898. He died January 13, 1981 in Tarrant, Jefferson County, AL, at 82 years of age. His body was interred in Jefferson County, AL. He married Lacey CHAMBERS August 27, 1921. She was born January 24, 1900. (Additional notes for Lacey CHAMBERS(36)) She died July 14, 1989 in Tarrant, Jefferson County, AL, at 89 years of age. Conflicting evidence states that she died in Leeds, St. Clair County, AL, July 14, 1989. William's occupation: Bank Vice President in Tarrant, Jefferson County, AL, until 1963. + 8 ii. Helen Perine NETHERY was born November 19, 1900. 22 iii. Frank Girault NETHERY(37) was born in Belle Mina, Limestone County, AL, July 11, 1903. He died March 9, 1978 in Sonoma, Sonoma County, CA, at 74 years of age. His body was interred in Sonoma, Sonoma County, CA. He married Mary Pratt GREENE December 23, 1943. She was born November 2, 1905. (Additional notes for Mary Pratt GREENE(38)) As of October 15, 1997, she lived in Sonoma, Sonoma County, CA. Frank's occupation: Accountant in San Francisco, San Francisco County, CA, until 1968.